Seriously, Another Church That’s Now a Home? 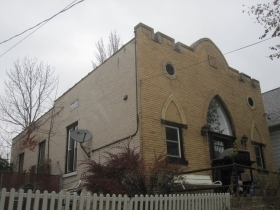 Yep, this 1927 Italian pentecostal church was finally turned into a one-family home in 2007. Seriously, Another Church That’s Now a Home? Photo by Michael Horne. It was not the original intent that House Confidential should serve as a forum for a disquisition on the architectural adaptability of early 20th century Italian-American Pentecostal church buildings. Yet, here we are. The Lord works in mysterious ways, indeed. In October, we visited a home on N. Van Buren St. that had been converted to a residence from its original use as an Italian mission of the Seventh Day Adventist Church. You’d think one such structure should pretty much cover the whole landscape of such exotica, but that’s not the way Milwaukee works. Now it is time to pay a call on a similar structure located just four blocks away. Like its counterpart, it was constructed in the year 1927. It was built for a congregation known as the “Assemblia Christiana,” which had initially held its services in a storefront on N. Jefferson St. in the Third Ward. In time it was decided that a new church building could be constructed on a vacant lot on this street that dead-ends at what was then Racine St., within sight of the towering St. Hedwig Roman Catholic Church. On November 23rd, 1926, building Permit #32709 was issued for the construction of this $5,000 church with exterior dimensions of 26 feet by 50 feet at what was then 260 Pearson St. Only 420 square feet of the building has a basement beneath, and this was built with concrete walls 14 inches thick. The structure itself is composed of 12 inches of solid brick. Most of the work was presumably done by parishoners. No architect or masonry contractor was listed for the building. But in 1926-7 if your congregation was largely composed of Sicilian immigrants, you’d be certain to have a number of them skilled in the building trades, and more comfortable working with brick and stone than the timber and lumber of their Northern European counterparts. The result is a solid, substantial building, more impressive in materials, if not in size, than its neighbors. Of the three non-Roman Catholic churches built by Italian immigrants in the Lower East Side, this one lasted the longest, with the congregation being active until the 100-seat building was offered for sale for $54,000 in 1996. 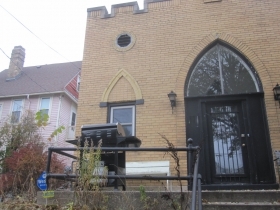 “Well kept brick church in excellent northeast area. Approximately 1,300 square feet and seats approximately 125-130 people. Pews Negotiable,” read the real estate listing. After 646 days on the market, it sold for $50,000. In 2003, the building was owned by Holy Hill Missionary Baptist Church, which sold it in 2004 to Pookster, LLC. By 2007 Pookster had converted this into a residence, 80 years after it was first built. By 2013, it was foreclosed, with Waterstone Bank registering the property. Finally, the current owner purchased it for $117,500 on July 23rd, 2015. The congregation changed its name from the original “Assemblia Christiana,” in 1930 when the name Congregation Zion Christian Church was adopted. It became the Italian Christian Church in 1941. In the 1950s it was listed as Chiesa Christiana, using the Italian word for church. In 1958 it was called the Italian Church of North America. By the 1960s, with Sicilian immigrants in short supply, the church reverted to the more generic Christian Congregation Church, by which name it continued to be known until its dissolution. It was affiliated with a group of Italian Pentecostal congregations known as the Christian Church of North America. By 1988, the congregation had fewer than 50 members. Good heavens, this makes Roman Catholic church history seem simple by comparison. Thirty-one years ago, this building was exempt, but the assessor took a look at it just in case it might enter the tax rolls some day, as well as to inventory the large number of tax-exempt properties in the city. The land was valued at $3,500 and the building as $17,600, for a total assessed valuation of $21,100. At the time the building was little changed from its original state, save for a gas conversion furnace installed in 1951. Today it is outfitted with two bedrooms and one bath, and at, 1,275 square feet of finished living area, it certainly offers some room to move around in. Pipe railing. Photo by Michael Horne. The building is of unmistakable ecclesiastic origin from the front, which is about the only exposure the structure reveals in this densely packed neighborhood. It has a crenelated false facade on the front, with Gothic arches surmounting the two windows that flank the central entry door, now much modified. A window above the door shows a large light fixture above in the small narthex. This window is a restoration, for the space had been boarded up for decades. Two circular windows provide light for what must be an awfully cramped attic space. The east and west walls are punctuated with windows to admit light into the interior. 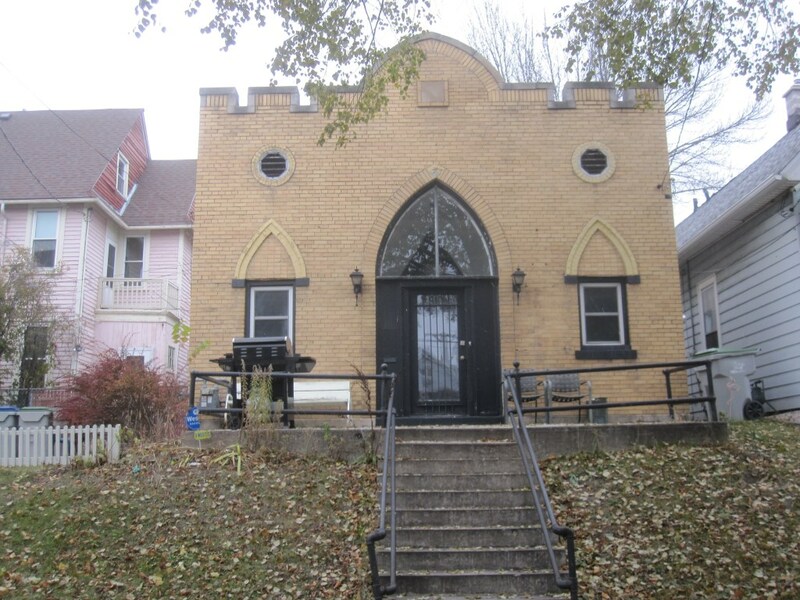 Like its counterpart on N. Van Buren St., this church house also has a commanding presence on the street, rising some ten steps above the level of the adjacent sidewalk. The steps lead to a concrete porch above. 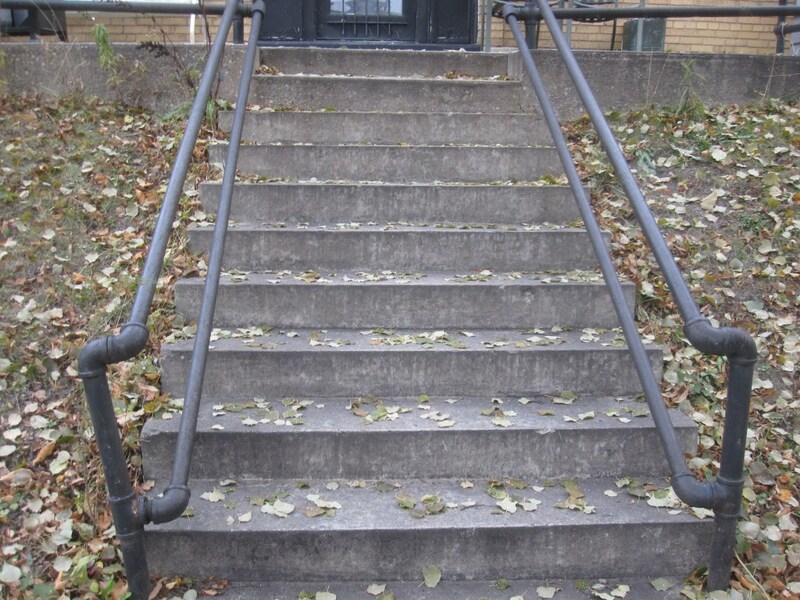 Both steps and porch have a sturdy pipe rail of a sort that is ubiquitous among homes of the era. All these details are apparently original to the structure. The porch also has a bench (not, alas, a former pew) that sits behind a gas grill, suggesting a fine setting for a church house picnic. Description: File this under “Novelty House,” a distinctive building of domestic scale not originally intended for residential use. Polling Location: Arlington Court Apartments, 1633. N. Arlington Pl. Transit Score: 57 out of 100. “Good Transit” Many nearby public transportation options. City average: 49 out of 100. Good heavens, this former church is just a block away from a major transit intersection. The number of people abandoning superstitious religious beliefs is increasing with each passing year. As a result more and more churches are being repurposed for more useful applications. Converting a church to a business or home dwelling eliminates the tax-exempt/tax-dodging scheme that religious cults enjoy. As taxpayers, we all benefit. Eliminating church property tax exemption could result in approximately 20% reduction in each property tax assessment. Perhaps some more Milwaukee religious properties will emerge as brew pubs or facilities for senior living. 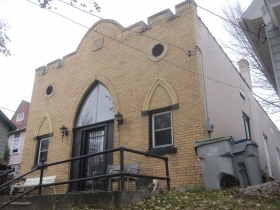 The Church Brew Works in Pittsburgh is a great example– it is an ex-Catholic Church. There is no indication that any of the many Gods disapproves of this trend.